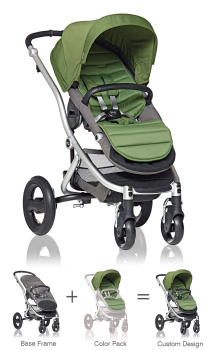 Turn the sidewalk into your personal catwalk with the Affinity Stroller by Britax. This visionary and versatile design exudes style and grace while delivering the level of comfort, durability, and functionality you demand. Start with our sleek base frame design upon which to build your customized look. With three elegant frame colors and six bold fabric colors to choose from, you can mix-and-match to suit your personal taste. But the customization doesn’t stop there. Our Click & Go system makes it easy to adapt the Affinity stroller to your changing needs—installing a bassinet, an infant car seat, or switching the direction of the stroller seat—without purchasing additional adapters. The Affinity Stroller features the same thoughtful engineering and attention to detail that has made Britax one of the most recognizable and trusted brand names among parents. From the cast aluminum details to the fabrics and accessories, everything is constructed with premium materials to ensure superior performance and exceptional comfort for both you and your child. Choose between silver, black, and white frame options. Each base frame comes with a reversible seat that features four reclining positions. Superior looks and style come from its cast aluminum hinges and clean frame design. Frames are sold separately. Complete your Affinity stroller with one of six bold Color Packs that includes a canopy, shoulder and buckle pads, basket liner, and machine-washable padded seat liner made of high-quality fabrics and custom tailored to complement the clean lines of the Affinity base frame. Color Packs are sold separately. The Bassinet keeps your newborn sleeping comfortable while showcasing your personal style. This beautiful bassinet is designed for infants up to 20 lbs and features an extendable canopy visor and zipper ventilation for added comfort. . Bassinets are sold separately. Elevate your style as the temperature drops with Affinity Cozy Toes. Available in all six Affinity Color Pack fashions, Cozy Toes features thermal insulation to keep your child warm with a wind- and rain-repellent outer shell to keep them dry. It easily attaches to the Affinity stroller seat and is held secure using the stroller harness. Cozy Toes has a full-length zipper down the front that provides easy access to your child and enhanced temperature regulation during winter travel. Cozy Toes are sold separately. The soft pneumatic tires, adjustable suspension, and supple leather-like adjustable handle offer easy handling for you and a smooth ride for your child. Our Click & Go system makes it easy to adapt the Affinity stroller to your changing needs—installing a bassinet, an infant car seat, or switching the direction of the stroller seat—without additional adapters.